Exiled from his native Bulgaria, Playwright and novelist Georgi Markov had just finished walking across the Thames on Waterloo Bridge. There he waited for the bus which would take him to his office at the BBC in London, a regular trip for him. He suddenly felt a sharp pain, as though he’d been stung by a bee, and turned to see a man grab his umbrella and hurry across the street and into a waiting car. Having already survived two assassination attempts, Markov was always on his guard. Arriving at work, he dropped his trousers to inspect the sting, and found a small pimple, which still hurt as badly as when he first felt it. By evening he had a fever and three days later, he was dead. During an autopsy a small pellet was pulled from the site of the sting, which later was determined to have been fired from the stranger’s umbrella, a modified device designed by the KGB. The pellet contained trace amounts of Ricin, which is derived from the seed of the Castor Bean plant. The pellet had been treated with a coating designed to melt at body temperature, releasing the Ricin into his bloodstream. Even if the doctors had figured out that he’d been poisoned, and isolated it to Ricin, he likely would have died anyway, as at the time there was no known antidote. 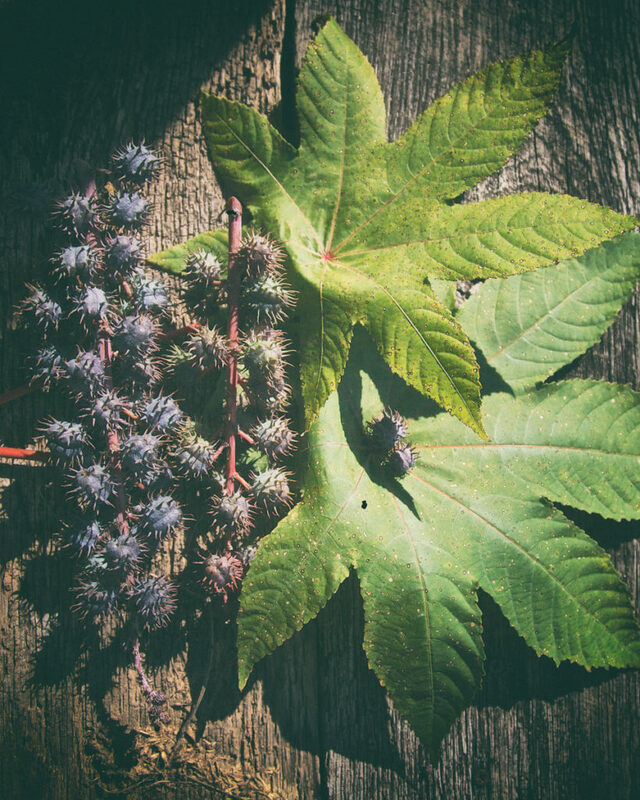 Because of this and a handful of high profile Ricin attacks, the Castor Bean plant has fallen under a dark cloud, ironic considering another name for the species is Palm of Christ, based on castor oil’s ability to heal various ailments and wounds. The ancient Egyptians were well versed in the healing benefits of the Castor Bean plant, and used it in over 100 different medications. It was even used to grow hair on women, and mixed with red lead could remove herpes from the face. Castor oil is made by pressing castor seeds into a pulp. Should a person care to, a relatively deadly poison could be made from the pulp, as it still contains a fairly healthy amount of ricin. Castor oil is good for skin ailments, be it burns or abrasions, styes in the eyes (though officially it should be kept out of the eyes), and as a rub or ointment it can help with everything from headaches, sinus infection and abdominal cramping. The latter technique was recommended by noted U.S. psychic Edgar Cayce. The merits of castor oil to induce labor is often debated, as the side effects can be nasty, with one of the most disturbing being diarrhea, quite natural considering its use as a rather harsh laxative. That is might not actually speed up labor would be another drawback, though it’s been used to do so for ages. Castor oil is effective as a laxative due to its ability to cause cramping in the intestines, and at high enough doses, the cramps can be gut wrenching. In fact, under Mussolini’s Italy, dissidents were hunted down and had castor oil poured down their throats, usually followed by a beating. Often, this combination proved lethal, and Mussolini wasn’t the only dictator to, pardon the pun, purge his enemies this way. But in today’s climate due to the war on terror, it is ricin which causes the most worries. Despite the fear imparted by just the mention of the word in a subway or other enclosed space, the chance of death by ricin poison is quite small, though not nearly as small as the actual attempts to incorporate the bean into the terrorist’s arsenal. This is partly due to the fact that ricin isn’t particularly fast acting, and there are now antidotes. In fact, a terrorist trying to extract ricin under home brew conditions is more likely to die from the process than anyone harmed in an attack. Still, ricin is considered a schedule 1 controlled substance, and possession is likely to land you in prison and on the evening news. 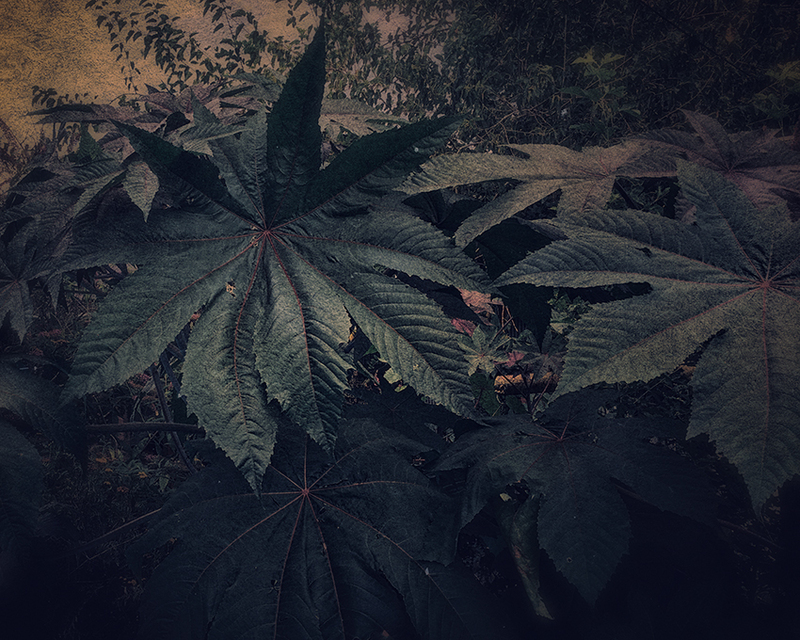 Castor Bean Leaves can sometimes reach three to four foot across. The main stalks of these were as big around as my wrist. In fact, if you swallow a castor bean seed and it manages to pass through your gut without breaking apart, you’d likely never even know. However, a child chewing up even a single bean can induce death, and not a particularly quick nor pleasant one at that. In two to four hours you’re pretty certain something is going on inside. If you’re lucky the stomach pain will make you vomit, and possibly bring the broken seed up. Eventually you’ll most certainly vomit, then comes bloody diarrhea, then dehydration. Following that the poison attacks the main internal organs, and unless treated, you’ll likely be dead in three to five days. Even with treatment, it will take a similar length of time to begin recovering. It’s likely the gruesomeness of the death that deters the use of castor beans in suicides, as a burning sensation begins with the first chew, and it takes about eight seeds to kill a healthy adult, not quite as many as a dog (11), more than a pig (7) and almost double the amount needed to kill a bunny. Ducks on the other hand can tolerate up to 80 before quacking their last. One of the main uses as applicable to a witchy garden though is to prevent moles in the lawn, hence its frequently used name, Mole Bean plant. Though our elders swear by it, there is little scientific evidence to support the claim. After all, moles aren’t equipped to chew seeds or beans. First, be aware that if you order enough seeds you might get a visit from the FBI. Also keep in mind that just touching the leaves can cause a rash, and when the plant drops its seeds, they can get all over the place. So for the love of the gods and all things holy, if you have small children, or adults who can’t grasp the idea that you shouldn’t pick up castor bean seeds from the ground and chew on them, make sure you remove the seed pods prior to them fallen in your witch’s garden. 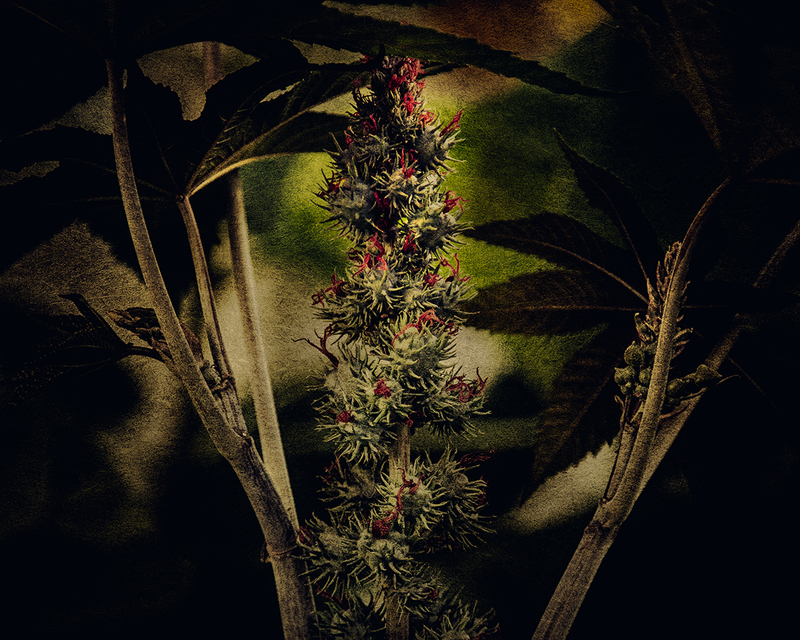 The Castor Bean is an amazing plant, easily growing four to eight foot tall with broad, serrated leaves which often grow up to 18 inches across. In fact, in warm locations the Castor Bean plant will grow like a tree, reaching up to 40 foot in height. I was told by a fellow who had a lot of plants come up volunteer, that I could dig up a few. I took one and a second a few weeks later, and transplanted them to different parts of the garden. Late in the season I was given another small one from a different garden. Upon transplanting, all three suffered and looked as though they might not make it. 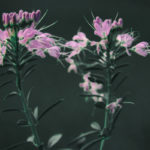 All three pulled out of it, but the time spent recovering meant only one reached maturity with full blooms and seedpods. But if you have cold winters, the Castor Bean plant will likely die, but don’t worry. Seeds are quite adept at self-starting the next year, and if they don’t it’s pretty easy to plant them yourself. If you start them inside the height is increased to up to ten foot, but otherwise just drop the seeds into average soil in late spring or early summer. Castor Bean plants like full sunlight, are fairly drought tolerant, and otherwise just give them space and let them go!